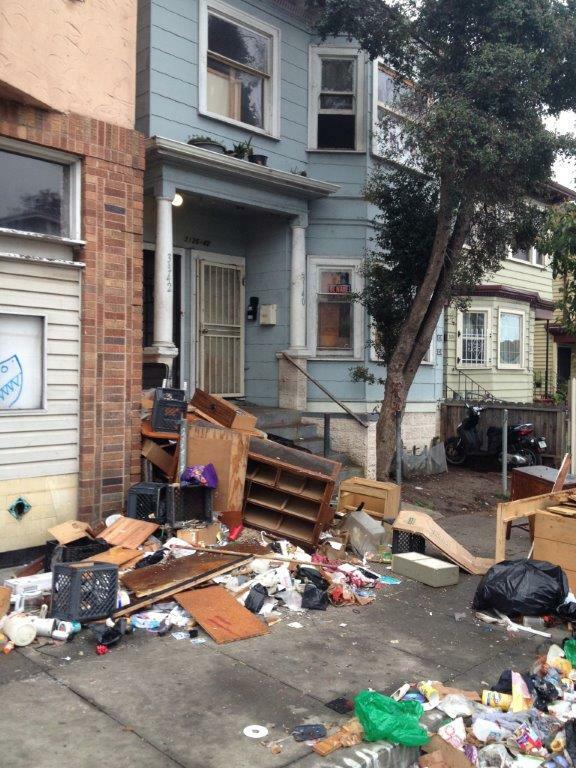 The City of Oakland's Reward for Reporting Illegal Dumping Program provides rewards to witnesses who identify people dumping in Oakland neighborhoods. Witnesses who report critical information to catch illegal dumpers can receive up to half of all penalties collected in successful enforcement actions based on the witness’s reports. The program is intended to encourage the public to help identify and put a stop to perpetrators' illegal behavior. 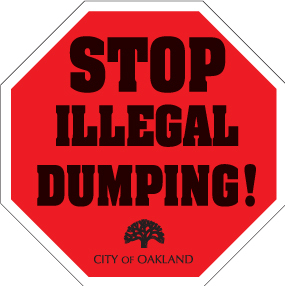 Illegal dumping is just that – illegal – it is against the Oakland Municipal Code: OMC 12.04.070 and CA Street and Hwy Code: § 5610. It is harmful to our communities because it is blight. It is a hazard to the public and tends to attract other criminal activities. 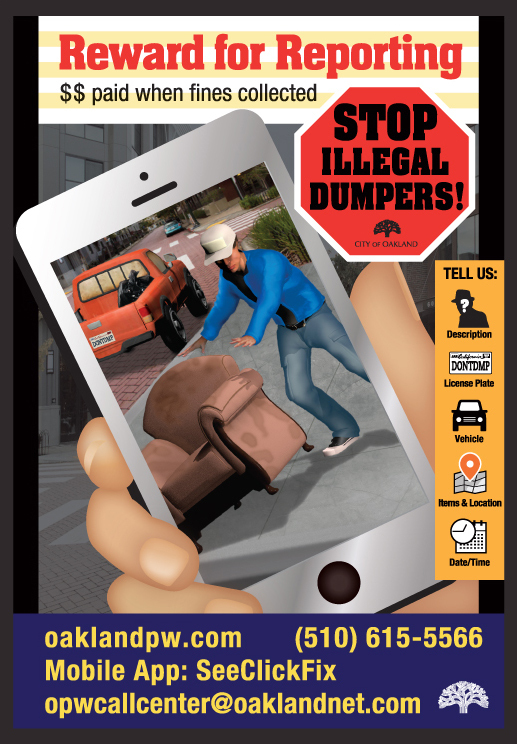 Report illegal dumpers to the authorities! Remove any illegal dumping soon as you can. Call the Call Center at (510) 615-5566, Monday-Friday, 8 a.m.-4:30 p.m.
Online: www.oaklandpw.com click on "Report a Problem"
Witnesses must provide their name and contact information (e.g., email and phone number) to the Public Works Call Center. Anonymous illegal dumping reports may be made to the City of Oakland, but anonymous reports will not be eligible for a reward. 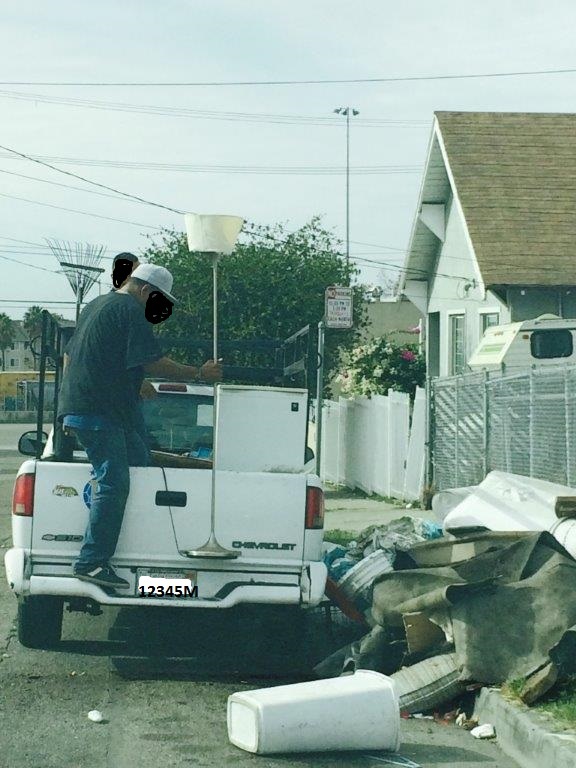 Witnesses must provide a signed statement describing the illegal dumping incident and offer any other available evidence, such as photos or video, when contacted by the City Attorney’s Office. If the reported illegal dumping incident proceeds to a hearing or judicial proceeding, witnesses must agree to appear and testify. The reported illegal dumping must result in a successful enforcement action (e.g., a conviction, finding of liability or settlement). After a witness report is received, the Call Center will forward information to the City Attorney’s Office, who then will contact the witness to gather statements and other evidence. If enough evidence exists, the Nuisance Abatement Division will issue a citation to the suspected illegal dumping violator or refer the matter for criminal prosecution. If the enforcement action is successful, Nuisance Abatement will contact the reporting witness and inform them that they are eligible for a reward. The enforcement process may take several weeks or months. If the enforcement action results in the City of Oakland collecting any monies, witnesses may receive $100 or half of all civil penalties collected, whichever is greater. If the enforcement action is uncontested but the City of Oakland receives no monies before forwarding the matter to Collections, witnesses may receive a nominal payment of $10. If there is not enough evidence to proceed with an enforcement action or the enforcement action is unsuccessful, witnesses are not eligible for a reward. FACT: Property owners are responsible for the maintenance of the sidewalk in front of their property. Leaving debris and/or bulky items on the sidewalk is illegal, unless a pickup of these items has already been scheduled. Removing material that is illegally dumped in front of a rental unit or adjacent properties by tenants or former tenants. OMC 8.11.550. Not condoning the unlawful disposal of waste. OMC 1.08.040, OMC 8.28. Please remove this debris immediately or the debris will be removed by the City of Oakland. If the City removes the debris, you may be charged the cost of removal and fines of up to $1,000 per day. Volunteer to Clean Up Your Community!